We have selected many fascinating and outstanding films for the fourth edition of the Art Visuals & Poetry Film Festival Vienna in 2017. In comparison to the last time the Festival has shown nearly double as much films. In all 82 films were screened on three days. 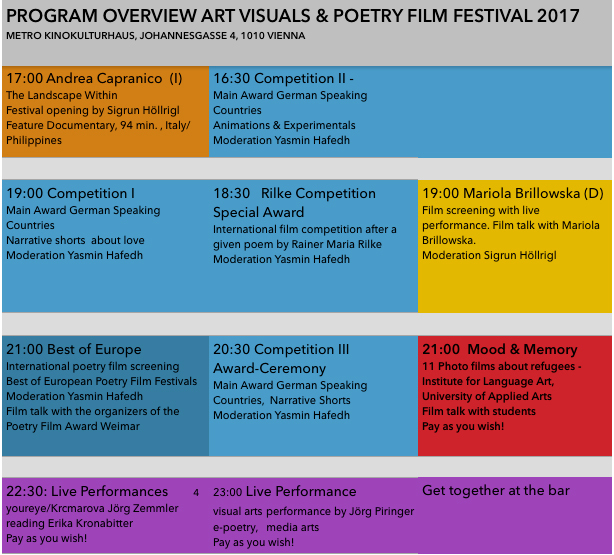 The Vienna festival became the second largest poetry film festival world-wide. The festivals has grown quite fast. A special atmosphere came up by the fact, that 36 film makers were joining the festival and presented their films in person. The Viennese audience was enjoying the festival program. But still many people in Vienna do not know the Art Visuals & Poetry Film Festival. We are working on getting more popular and known by the On Tour program serie during the festival pause.